Lex Scott (left) and Cedric Primous (right) pose for a photo on Feb. 5 at the Salt Lake City Public Library's Marmalade Branch. Primous, 24, moved to the Beehive State from Marshall, a city in northeastern Texas, where he said the Ku Klux Klan was present. He’s now one of the few Black comedians in Salt Lake City. Even though racism may not be as visible in Salt Lake City as it is in his hometown, Primous said it’s still here. He said he is often stared at. Once while he was at a mall in Layton, he said a white mother told her child not to talk to him. 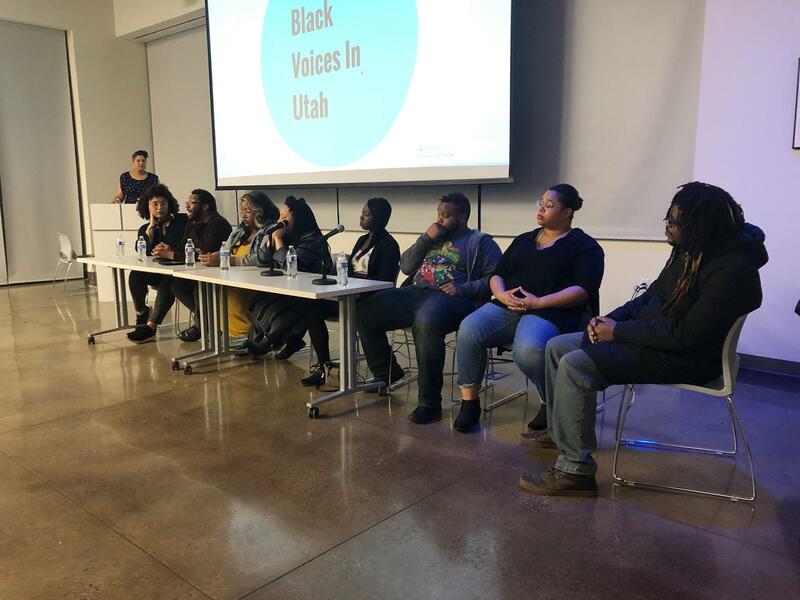 Primous recounted those experiences Tuesday night as one of eight panelists at an event titled, “Black Voices in Utah,” held at the Salt Lake City Public Library's Marmalade Branch as part of Black History Month in February. In Utah, African Americans make up less than 2 percent of the state’s population, according to the U.S. Census Bureau. Like Primous, other panelists said they too feel like outsiders in Utah. Some are the only African American in their workplace and feel they have to act as ambassadors for people of color. Others described the exhaustion of being treated like tokens or having to constantly explain their culture, and what is acceptable to say about them, their community and culture. “Black voices aren’t heard very often here in Utah — not in the media, not in schools — and I wanted more spaces that amplify black voices,” said Lex Scott, the event’s organizer and the founder of the Black Lives Matter’s Utah chapter. At the event, she asked the panelists about their first time encountering racism, dating in Utah and what they love about being black. Jayrod Garrett was one of the Utah natives among the panelists. He grew up in Ogden and is a former member of The Church of Jesus Christ of Latter-day Saints. When he was about 8 years old, Garrett said he was called the n-word by children from his church. When he told his bishop about the incident, Garrett said the bishop didn’t believe them because the kids came from “a good family.” Later in life, Garrett said he saw the church oppressing the LGBT community in a way similar to how African-American were oppressed in this country. He decided to leave the church. “Seeing that there was no intention of changing, it wasn’t a place I could stay at anymore,” he said. In her experience, Scott said most people tend to deny racism exists when they hear about incidents like the one Garrett faced. She urges people to stop and listen, rather than shying away from the issue. Scott said she hopes more white community members become allies of people of color. Toward the end of the event, Garrett and others shared what they love about themselves and their culture. Some shared that they have grown to appreciate their natural beauty, their hair, their skin, the flavors of their foods. Garrett talked about learning empathy from his life experiences. “There’s nothing that’s taught me more compassion for other people than being black,” Garrett said.